Subject: Historical scene , Officers in “Palais Sans-Souci”, Roi Henri Christophe. 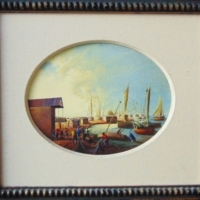 Oil on Board – Very rare piece, probably the only one available in the US. 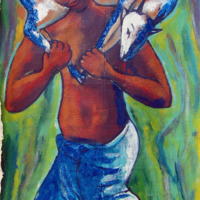 Yves Etienne worked from the northern city of Cap Haitien, and is one of the best representatives of the local school of art who under the technical and artistic guidance of Philome Obin is so typical of modern Haitian painting. Obin created a revolution by himself after starting to paint what he saw around this place in between the two world wars. 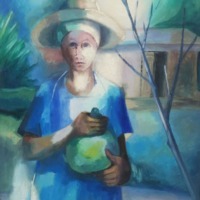 Haitian art was until then very similar to that of French artist of the Revolution, depicting important people in a very European way, posing in their best clothes, in their office or home, with their staff…. Obin painted country farmers and daily life of normal people in a very simple, naive, way, kin of douanier Rousseau. 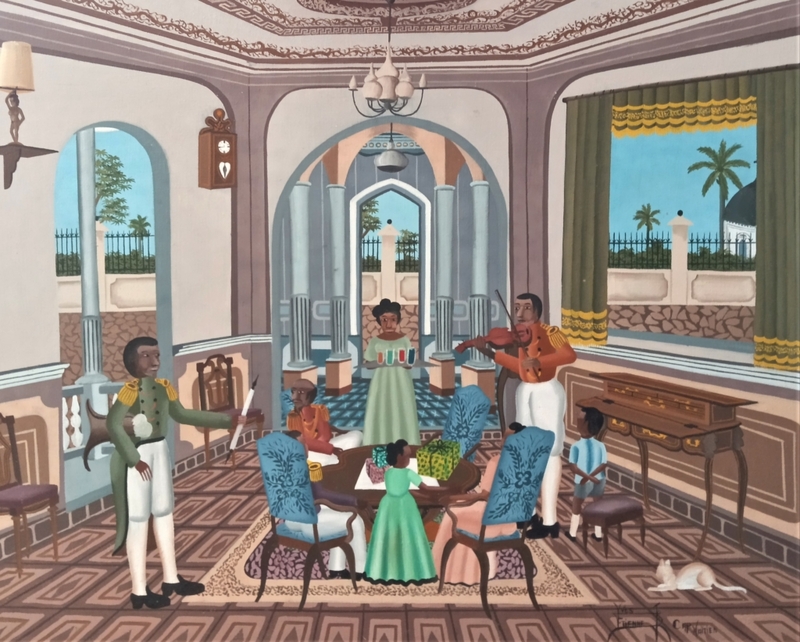 After the second world war he was already a respected artist, and locally people took on his example, depicting normal life but evolving to daylife of the past, historic visions of what is was like in the days of the Sans-Souci palace, the citadel if not Toussaint Louverture and his generals meeting before fighting the French. 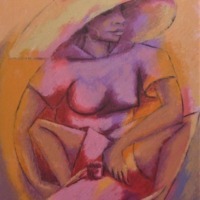 Yves Etienne is one of those local but well known artists of the Cap.